Twitter is a really effective way to tell other people very briefly and in a nutshell what you are thinking or doing, and also to keep up with whatever it is that others are thinking or doing at any given minute. However, we mostly just read other people’s feeds from our own home page. We don’t actually visit their Twitter page to see what they are up to. I assume this is how other people check my tweets too, so it sometimes seems a bit of a waste to go through the trouble of adding a personal touch to my Twitter background. So why bother? Well, just like your Facebook Cover, your Twitter background gives new visitors an idea of what type of a person you are and what sort of tweeting you do. If they like your background or are able to relate to it, they are very likely to follow. If you add your Twitter link to your website or blog, you are going to have a lot of new visitors and you will want to give them a good impression. Also, if your followers find your background attractive, they will come back to you often. A good background also tells your potential followers that you are serious about tweeting, and won’t waste their time. This is a bit of a surprise, right? Twitter itself provides some custom backgrounds that you can pick from. The problems is there are just 20 odd designs to select from, and most of them are very simple and minimalistic. Plus, so many people use them that they don’t have any uniqueness. Use them if you have no time to browse around for backgrounds. Twitround has hundreds of customized backgrounds that are amazing to look at, and many of them are free, though you do have to pay to use some of the best. 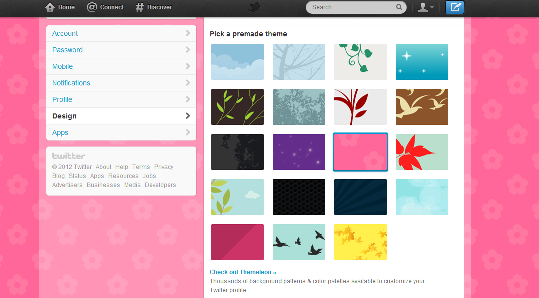 The backgrounds can be added to your Twitter in three small steps. Twitr Backgrounds lets you select from over thousands of backgrounds, all neatly categorized as nature, animals , sports, photography, and so on. The themes themselves are perky and eye catching. The backgrounds on this site even allow you to add links to your other social networking accounts or your website or blog to the sidebars. For more awesome Twitter backgrounds that will blow your mind, visit the Themelwon website. Not only can you choose custom backgrounds, you can also make your own backgrounds by selecting color palettes and combinations. Like all the other sites here, Twitlay also gives you a lot of backgrounds to choose from, but the one I liked best let me create a collage of the thumbnails of all my followers, or alternatively, all the people I am following. Tired of just selecting custom made templates? If you want to make your own changes to your background, vist this website to play around with color combinations, shapes and designs, and textual links.